Editor's note: One in an occasional series about “hidden gems” on the Samford University campus. Tucked away on the second floor of the Harwell Goodwin Davis Library is the beautiful bronze statue of Samford University 1967 alumna Martha Crystal Myers. Myers lost her life in December 2002 doing what she loved; serving the Foreign Mission Board as a medical missionary in Yemen. Myers had the Samford red and blue running in her blood since birth. Her parents, the late Ira Lee Myers and late Dorothy Will Foust Myers, both graduated from Howard College. Myers always had a passion for helping others. Upon graduating from Samford with a Bachelor of Arts degree, she enrolled at University of Alabama at Birmingham to begin medical school. After her third year, Myers participated in a Southern Baptist Foreign Mission Board Preceptorship Program which allowed her to spend two months in Jibla Baptist Hospital in Yemen. This experience ultimately marked the beginning of her passion for medical missions and cultivated her strong desire to serve the people of Yemen. Once Myers returned to Birmingham she completed her medical degree and did an internship/residency in obstetrics at the University of South Alabama Medical Center in Mobile. Not one to slow down, Myers then went on to study at Midwestern Baptist Theological Seminary, Kansas City, Missouri. To round out her educational endeavors Myers spent a few months in Polyglot School Ltd. in London, England, forming the basis of her fluency of the Arabic language. Myers then returned to her beloved hospital in Yemen, an 80-bed facility that treated 40,000 patients yearly. She worked six long days a week; two days a week she performed surgeries, two days a week she was in an outpatient clinic, and she spent the remaining two days on the road, traveling to villages in the surrounding areas to give vaccinations and teach people about health care. The Foreign Mission Board made plans to close the hospital and Dec. 30, 2002, was its last day of operation. On that fateful day a man by the name of Abed Abdel Razzek Kamel, a member of an al-Qaida, murdered Myers and two other missionaries. Myers was laid to rest in a gravesite on the grounds of the hospital compound in Jibla and her tombstone reads “She Loves God” in Arabic. That same phrase can be found on the statue honoring her life in the Davis Library. Myers’ statue is truly representative of the servant-hearted woman she was. She is dressed from head to toe in her medical uniform with no skin exposed, as was custom of women in Yemen. In her hands lay a roll of bandages and a prescription pad. Myers was inducted into the Alabama Women’s Hall of Fame in 2007. 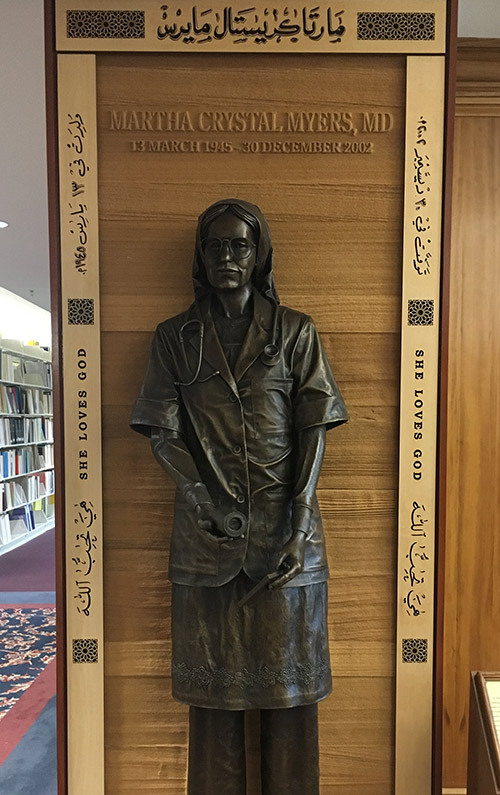 Her statue can be found on the second floor of Samford’s Davis Library in the Marla Haas Corts Missionary Biography Collection. Olivia Williams is a 2017 graduate and a former news and feature writer in the Division of Marketing and Communication.